An American frigate, tracking down a ship-sinking monster, faces not a living creature but an incredible invention -- a fantastic submarine commanded by the mysterious Captain Nemo. Suddenly a devastating explosion leaves just three survivors, who find themselves prisoners inside Nemo's death ship on an underwater odyssey around the world from the pearl-laden waters of Ceylon to the icy dangers of the South Pole . . .as Captain Nemo, one of the greatest villians ever created, takes his revenge on all society. More than a marvelously thrilling drama, this classic novel, written in 1870, foretells with uncanny accuracy the inventions and advanced technology of the twentieth century and has become a literary stepping-stone for generations of science fiction writers. Jules Verne was born in France in 1828 and died in 1905. His collaboration with the publisher Pierre-Jules Hetzel was wildly successful, producing many brilliant novels in the burgeoning genre of science fiction: 20,000 Leagues Under the Sea, Journey to the Center of the Earth, and Around the World in 80 Days, among others. Verne is the second most translated author in the world, after Agatha Christie and before Shakespeare. 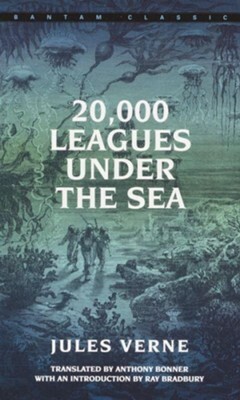 I'm the author/artist and I want to review 20,000 Leagues Under the Sea - eBook.